During breakfast the next day, we wondered about how to get back to San Francisco, the airport and what time we needed to be there. The Coed pulls out her ever-present phone and starts doing web searches to get some answers. In the same style as everyone else throwing questions at her, I ask for the air speed velocity of an unladen swallow. Without missing a beat she looks up deadpan and asks for clarification. “African or European?” she returns. My faith in the younger generation has been restored. I only wish I could have had the chance to ask her for the answer to the ultimate question about life, the universe, and everything. This girl really knows where her towel is. In a little while we load up the van and head to San Francisco. No more curvy roads but lots of farmland. Uncle and I try to figure out what kind of tree crop we are seeing for miles and miles till we enter a town touting itself as the Olive Capital of California. That made much more sense than our theory of tiny green apples. We get into our motel in San Francisco a little before check-in time and only one of our rooms is ready, but in no time the other room is open and we have the bags sorted. I make an off-the-cuff comment about the fireplace not working which stops uncle in his tracks. His room doesn’t have a fireplace and since we had some fireplace problems in the rustic inn by the seaside, he didn’t know if I wanted him to fix it or switch rooms. He looks around, sees there is no fireplace, recognizes my big grin and realizes I finally got one over on him. Later that afternoon, under coed’s navigation, we drive to Fisherman’s Wharf. On the way we take the scenic route and learn how steep the hills are that we’d only heard about. Once again I think the van is gonna roll only this time long ways over the front. We survive the hills, as everyone does, with new respect for S.F. drivers. On the way we notice everyone wearing jackets which not one of us had thought of wearing ourselves. So once we arrive and pay what I consider an astronomical price for parking, the first order of business is buying everyone San Francisco Souvenir jackets. We explore the Mechanical Arcade, the docks with the Liberty ship and the submarine. Then we move on to find a place to eat. The coed wants to try crab for the first time in her life so that becomes our first criteria. Then we learn that MP on a menu means Market Price. Then she learns what the Market Price is in dollars and she is totally ok with not getting crab. Snowball would have none of that. We were here to make memories so we find a seafood place and the Coed gets crab. Snowball and Aunt-of-Snowball have a huge sampler platter and Uncle finally, for the first time this trip, gets scallops that are real scallops so even he is happy. We then have a smooth drive back to the rooms via Embarcadero and other highways. The next morning we head to the San Francisco International Airport first to return the van from hell. Then we tram and elevator our way to the check-in, this time with Frontier. The line is already long when we get there so it takes a while. Our group passing the time in the airport looking at pictures taken on the trip. It seems like the TSA has tightened up their procedures. There is no TSA-pre and everyone is getting put through that millimeter wave thing with their hands over their head. Snowball had repacked her tech bag and put any weird looking scanners in a separate bag so she could open and show stuff quickly. I’m carrying just the normal computers and cameras. She and I go through without incident. The same can not be said for Uncle-of-Snowball. He lights up like a Christmas tree under the scanner and has to be hand scanned. The agents could see every piece of Vietnam-era shrapnel in his body. He gets quite a chuckle out of it. 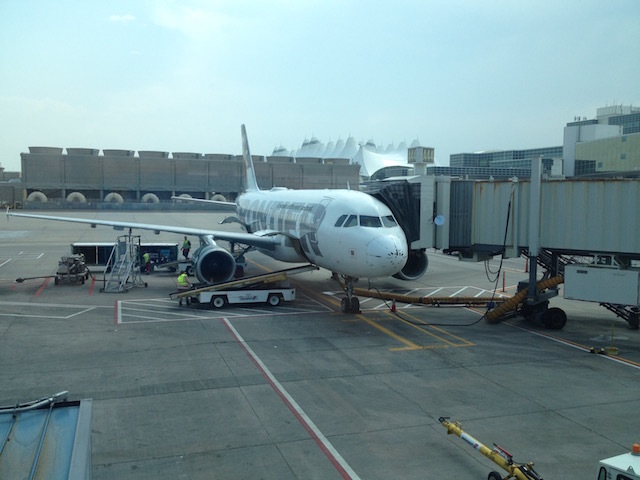 The actually flying part of the trip goes without incident – as long as you don’t think about the tight space and tiny seats that Frontier puts on the Airbus 319. When landing in the Denver hub, the pilot gives the local conditions. It was the first time I’d ever heard one of them describe the sky as “smoke filled” from the forest fires out west. Then, when we get to the airport at our final destination, it was directly under a thunderstorm. We have to circle over another state for 45 minutes while the storm passes. Even after that the landing is not bad. Daughter-of-Snowball and boyfriend pick us up in two cars, of course. Snowball and I finally get home to the compound while others still have a drive home to other cities. It was a long trip and typical of a family vacation with good times, difficult times and stronger love because of the shared times.